Traveling with an architect is the best way to see a city. Okay, I'm biased: I am an architect. But here's the thing: You have your own tour guide speaking the strange language of buildings, city form, and wayfinding. My wife and I recently went Montreal for the jazz, the food, and the architecture. We each had our priorities, and mine were the city's many landmarks and landscape features. 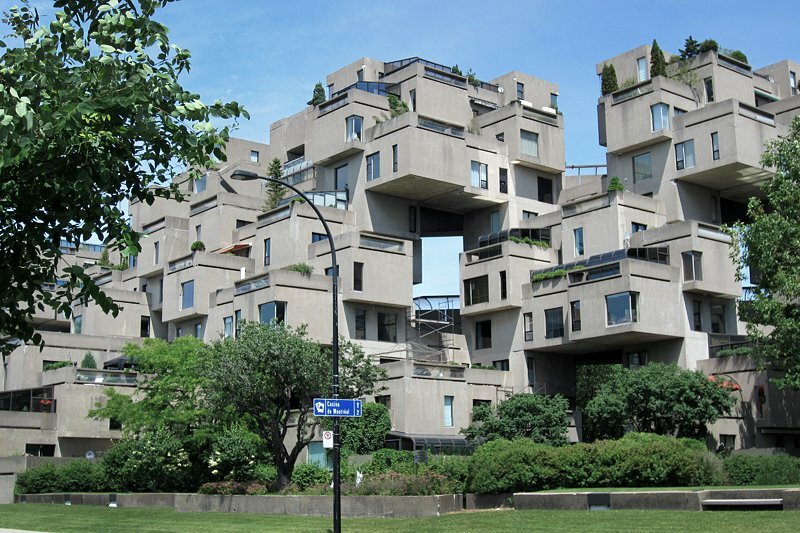 Of course I had to see the beautifully preserved and once-walled and the lush city parks, but my most anticipated visit was , a housing complex off the Saint Lawrence River designed by Moshe Safdie, who was at the time a very young architect. Visiting the building required a bike ride through the old city along one of the networked bike paths winding through industrial waterfront canals. The Habitat is a beautiful arrangement of stacked cubes forming a single structure in the area known as . It was built for Expo '67, entitled "Man and His World," from the title of Antoine de Saint-Exupéry's masterpiece. Housing was one of the main themes. Saint-Exupéry wrote: "We have to make lively this new house that doesn't have a face yet. The truth for one was to build; it is, for the other, to occupy it." (Anyone else miss the Montreal Expos?) This particular exposition was the we-have-arrived moment that changed Montreal into an international destination. Also on my must-see list: newer, modern structures with beautiful glass façades, like by Patkau Architects, by Lapointe Magne with Aedifica, and by Saucier + Perrotte Architectes. The final stop was the for the wonderfully crafted exhibitions and the expansive, thoughtful bookstore and reading room. This place would thrill any architect, designer, or student, though if my experience is any indication, their traveling mates might have to drag them away. To arrange a visit, email [email protected]. Mark is a principal at , a lecturer at the University of Pennsylvania, and a Brooklyn denizen. A modern-day flaneur, Mark travels for buildings, food, and big ideas.